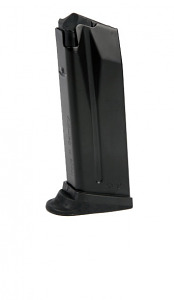 Factory Heckler & Koch HK45 Compact and USP Compact .45ACP blued 8RD magazine with Extended Floor Plate. I can't believe how fast these guys are with shipments! Very impressive. Add to that their extremely competitive (see also, CHEAP) prices, and you've got the perfect combo for mags, etc. WILL be ordering from them again...and again...and again and etc. Excellent factory mags. Work perfectly in my HK. Authentic new in wrap HK. Very fast shipping.